I was installing some apps and icons then I noticed that there were about 4 games installed, so I went to the Software Centre to remove them. Then I wanted to add my Facebook account to Online Accounts but Alas! It was disappeared. But it was there when I searched for Online Accounts in the Unity Dash. Please help me. I think I might have uninstalled the wrong packages. Can anyone tell me the packages that are associated with them? Below are screenshots of my settings window and the Online Accounts icon in the Unity Dash. I think I have added the gnome3 ppa in my ubuntu 13.10 for the sake of installing gnome desktop environment but after adding the ppa I changed my mind so I removed it. But before removing it I ran a update, so I think the gnome 3 ppa replaced the online acoounts, appearance, etc etc apps and so I installed synaptic. Go to the gnome-control-center and mark for complete removal and then applied the changes then I installed the gnome-control-center through synaptic and voila it worked. The problem was solved. But this method a little bit dangerous. Can any expert have a eye on this. You might have accidentally uninstalled the ubuntu-desktop meta-package. Not the answer you're looking for? Browse other questions tagged unity-dash 13.10 appearance system-settings online-accounts or ask your own question. Can't delete Facebook and Google in Online Accounts! Where is the config file for Ubuntu Online Accounts located? My Ubuntu 12.04.2 Online Accounts only has Google and Windows Live accounts. Where are the others? how do I activate the dash to display feeds from my online accounts in the social media lense? 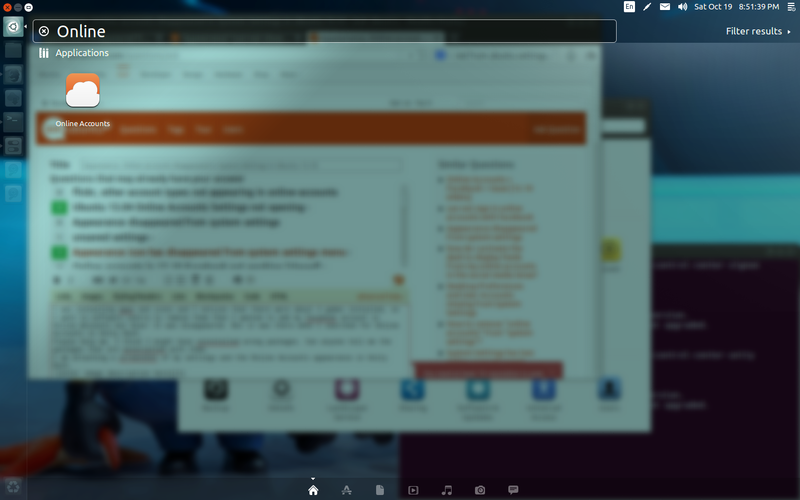 Why doesn't Ubuntu offer the same Online Accounts as Ubuntu Gnome?